Driving in to Tucson along I-10 from the East, you see two beautiful triangular peaks ahead of you, looking like sharks’ teeth. The left one is Cat Mountain and the right one is Golden Gate Mountain. They call out to be climbed. Drive west along Speedway and over Gates Pass. A few hundred yards past the top of Gates Pass is a large parking area on the left. 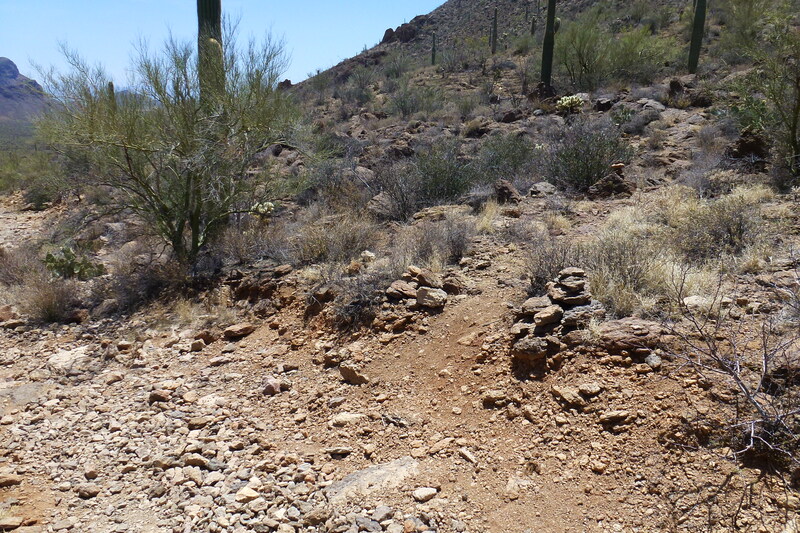 This is the trailhead for the David Yetman trail. Park here. Golden Gate Mountain is the peak on the right as you look up the trail. 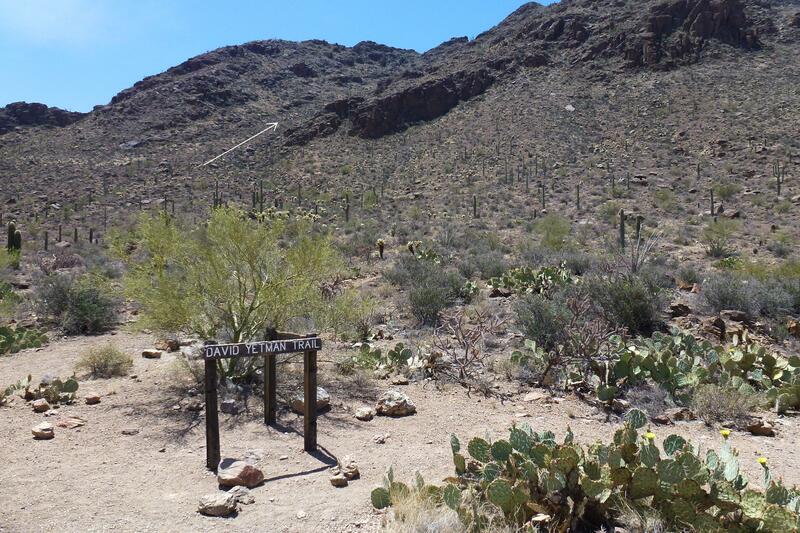 Hike up the David Yetman trail for a few hundred yards to the crest, where you will see several big trail signs. If you look at Golden Gate Mountain from here you’ll see a cliff up and to the left. The trail goes up the gully to the left of the cliff, as shown by the arrow in the photo. Continue along the Yetman trail and you’ll soon go down some man-made steps. About twenty feet past the bottom step you should see two cairns on the right of the trail, marking the start of a faint climbers’ trail leading up the mountain. Follow this climbers’ trail upwards to the summit. The trail is well-marked with cairns, especially as you get higher, although the lower section is not as well marked. It should take you less than an hour to get to the top,. From here you have wonderful views of Cat Mountain and Little Cat Mountain off to the southeast, with the trailer-park retirement community of Tucson Estates spread out below them.